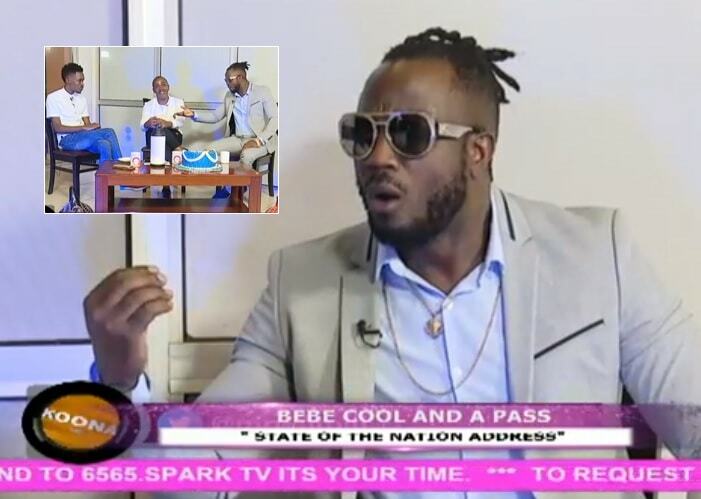 Bebe Cool who has been in South Africa was on Friday appearing live on Spark TV with the Koona show host, Miles Rwamiti. In studio was also Apass with whom they have had a number of disagreements, scroll down for the 2-hour-interview. "Eddy Kenzo is suffering from inferiority complex, he cannot deal with fame. I remember very well when he beat up Kasuku, he has serious issues going on in his life." "In this music industry, one of my neighbors if you so recall neighbor A and B, one of them had taken the direction of not being true to himself and lying to the fans, I objected to that." "He was lying to fans that he is Africa's finest, he has five cars and as he was uttering such, fans had started looking with a keen eye to establish if those assets really existed." "Matters were made worse when he got problems at his home, [The Karamagi saga], he abandoned his home straight to his Father-in-Law's home in Bbina. If that happened an indeed you had those many homes that you talk about, you would have ended up in one of them and not at your in-laws." So now back to Dirisa, what hurts you most, if Bebe Cool does not include you on his list? In fact, you should be happy that I did not rate you, because If I'm to rate you, you will not even appear in my top 20 artists."